The mechanical room includes a CERV fresh air conditioning unit, ground loop heat exchanger and a hybrid heat pump water heater. The 1990s brought the fear of a pending computer meltdown in 2000 (Y2K) and, well, the Spice Girls. But it was also a time when both the industry and building owners started talking a lot more about indoor air quality (IAQ). IAQ became a popular catch phrase when we realized we needed to address volatile organic compounds (VOCs) in new homes and buildings. In the last few years, evidence has been mounting that cleaner operating, zero energy homes and passive houses are becoming more popular. In the quest to save energy we are reducing air changes per hour and re-using indoor air more. But, is that healthy? It may be time for a new era for IAQ where we see new ventilation approaches and refinements. For some, heat recovery ventilators (HRVs) and energy recovery ventilators (ERVs) are still fairly new concepts. However, manufacturers are already turning their attention to more sophisticated ventilation devices that may still improve air quality along with energy conservation. A conditioning ERV (CERV) uses air sensors to continually monitor carbon dioxide and volatile organic compounds (VOCs), and ventilates as required to maintain fresh, healthy air. It uses air flow and its own one-third ton heat pump, which doesn’t require an outdoor unit. “Asthma used to affect about two to three per cent of North Americans. Now it’s up to eight to 10 per cent,” said Ty Newell, professor emeritus from University of Illinois, who has been studying indoor air quality for decades. About 10 years ago he designed the first CERV unit and has been testing and developing it ever since with his company, Build Equinox in Urbana, Illinois. “We spend about 70 per cent of our time inside our homes,” says Newell. One of his case studies opens with the statement that: “Poorly ventilated homes and buildings are making us stupid, sick, and tired.” His work aims to prove that buildings with better air quality result in improved cognition, citing Harvard and ASHRAE studies as sources. Newell says most of our buildings unfortunately do not have good indoor air quality. The CERV sensors detect carbon dioxide, methane, propane, butane and 19 high and medium high VOCs, including acetone, sodium hypochlorite, and Windex. Even 80 proof bourbon made the list, a testament to the rigorous Build Equinox testing procedures. The sensors allow the unit to determine precisely when ventilation is necessary, or when the air is fresh enough to stop ventilating. It can adjust and optimize efficiency with variable speed compressors and fan control and can shut down motorized dampers connected to the outdoor grilles, circulating the indoor air instead. The CERV sensors monitor air quality and temperature room by room. Used in super insulated passive houses so far, the CERV has proven effective at finding the right ventilation levels to significantly improve the quality of indoor air. During its recirculation mode, it has also contributed to a more efficient space heating and cooling strategy in some of these smaller, tighter homes. It comes with sophisticated controls for optimization and analytics, and three input and six output channels to trigger external devices. This allows the CERV to do zone control, while also monitoring and operating a bathroom heater or other external heaters. CERV units have been equipped with online monitoring from day one and have tended to be installed by forward-looking developers, working with Build Equinox on continuous improvement. “We do online version upgrades during the year like Tesla, except we did it before they did,” says Newell. The technology and builder relationships have allowed them to continuously study all their installations. 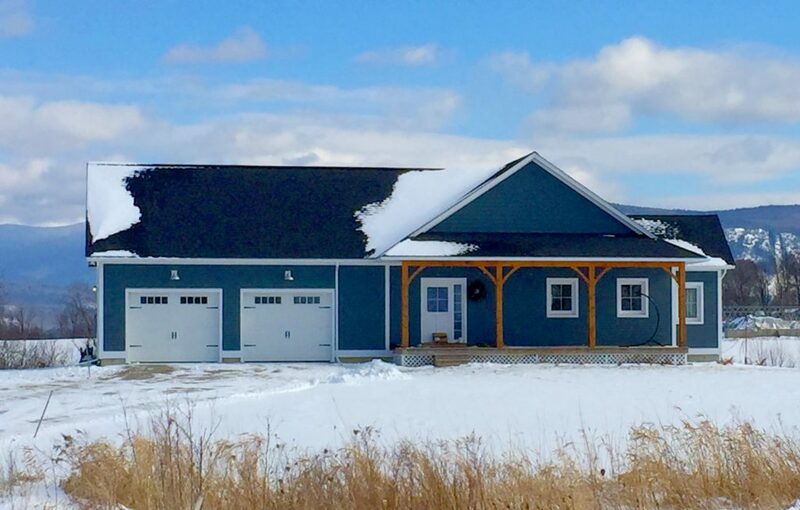 The case example involves Vermod High Performance Modular Homes, a collection of 80 prefab passive homes in Vermont, ventilated with CERVs and also equipped with heat pump water heaters. Thirteen of the houses are about 12,500 sq. ft and are heated and cooled using Mitsubishi VRF systems. Newell has extensive data on their performance, dating back to early 2015. In winter, the mini-split heat pump provides heat to the living room, dining area and kitchen. The hybrid water heater removes heat from the air around it in the mechanical closet. Its cool exhaust air is picked up by the CERV’s supply fan. 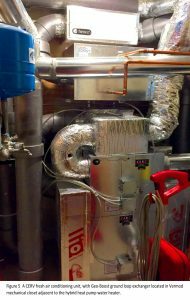 The heat removed by the water heater must be replaced by a combination of the mini split and the CERV. Efficiency is higher than if an electric water heater had been used instead of the hybrid water heater. The mini split and CERV lift energy from cold outdoor temperatures to indoor air temperatures. The hybrid water heater lifts energy from room temperature to hot water temperature level. Summer thermal performance efficiency is greater than winter because the hybrid water heater has a dual benefit, said Newell. It heats water with a useful by-product of the cool, dehumidified air that the CERV distributes to the rest of the home. If the CERV did not circulate air from the water heater, the mechanical closet would get colder, reducing water heater efficiency. The primary energy usage in the 13 homes is nine kilowatt hours per sq. ft. per year (97 kWh/square metre per year) This saves homeowners around $1,000 to $2,000 per year in utilities. Not bad for small houses in one of the harshest U.S. climate zones. Chris and Judy Lee’s Goderich home features an earth tube that preheats incoming air. In the Lee home, there is no heat pump to keep the ventilation air warm during extreme cold. The CERV controls and operates an auxiliary 5kW electric duct post-heater. Together they deliver 17,000 BTU/hr, again in conjunction with a heat-pump water heater. 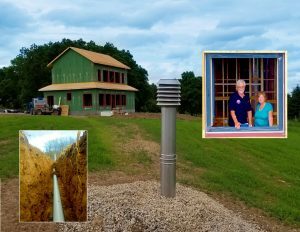 The Lees also installed an EcoAir earth tube, which is an eight-inch diameter, 180 ft. long tube buried about six feet below ground, where the temperature is approximately 6 C to 8 C. It works passively, providing up to 4,500 BTU/h of pre-heating in the winter and pre-cooling and dehumidification in summer and shoulder seasons. It comes in a residential package with prefab stainless-steel inlet tower, filters, and condensate sump. Sloping the earth tube one per cent toward a condensate sump prevents build-up of moisture (and mold growth). Former dairy farmers, the Lees have a 100-kilowatt solar array on the roof of their barn, which eliminates their monthly cost for power, heat and cooling. The CERV unit also alleviated Chris’ lifelong allergy problem. Thousands of zero energy buildings are now being built across North America and municipal building codes are moving in that direction. It might be time to think about how you are going to incorporate new building technologies like passive house, CERVs, earth tubes and IAQ 2.0 into the services offered by your business.